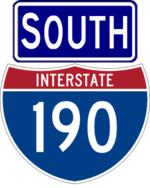 I-190 is a highway running from the mainline Thruway through downtown Buffalo to Niagara Falls and Canada. 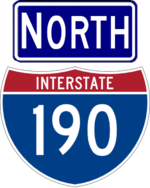 Originally numbered I-90N prior to the elimination of most suffixed interstates, the majoirty of the route south of Niagara Falls is maintained by the Thruway Authority as the Niagara Thruway. 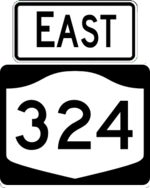 The exit numbers and mileposts on the Niagara Thruway officially have a N prefix (which is not shown on exit signs). The Buffalo Toll Barrier (northbound after I-90) and the Black Rock Toll Barrier (southbound before the Peace Bridge) were both removed due to complaints by the city of Buffalo as part of a deal with the state that included the removal of I-84 from the Thruway system. It is the only signed three digit interstate to cross an international border. 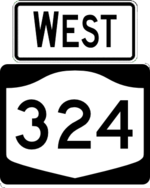 Sheridan Drive NY 324 officially joins I-190 at this point but is not signed as such.